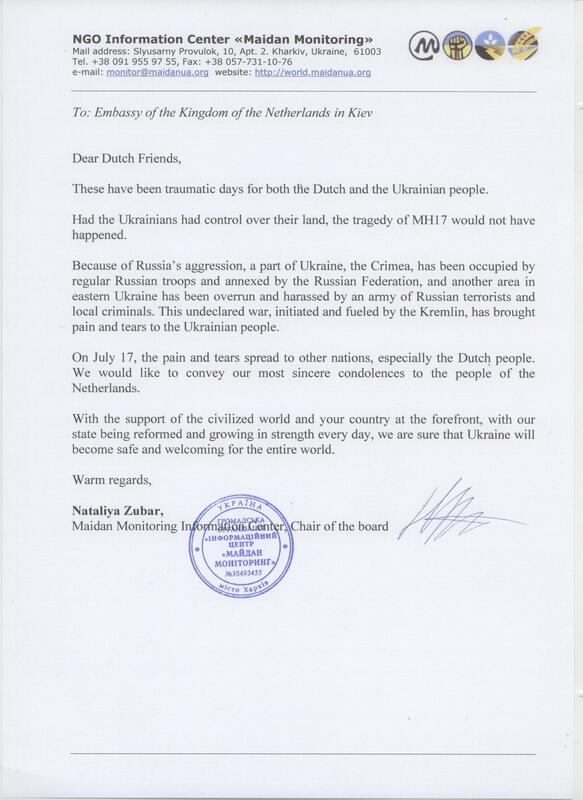 These have been traumatic days for both the Dutch and the Ukrainian people. Had the Ukrainians had control over their land, the tragedy of MH17 would not have happened. Because of Russia’s aggression, a part of Ukraine, the Crimea, has been occupied by regular Russian troops and annexed by the Russian Federation, and another area in eastern Ukraine has been overrun and harassed by an army of Russian terrorists and local criminals. This undeclared war, initiated and fueled by the Kremlin, has brought pain and tears to the Ukrainian people. On July 17, the pain and tears spread to other nations, especially the Dutch people. We would like to convey our most sincere condolences to the people of the Netherlands. With the support of the civilized world and your country at the forefront, with our state being reformed and growing in strength every day, we are sure that Ukraine will become safe and welcoming for the entire world.